Hello and Welcome from the Saltwater Angler. 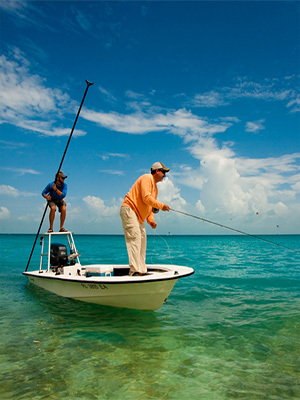 We hope that our Key West fishing report will help guide you to catching what's biting! With the winds and rain finally subsiding, more fishable weather is approaching. Getting an early start is key this time of year. The Tarpon bite has been steady from pre-sunrise till around early morning using darker fly patterns with just a little flash. Moving onto the flats with a good incoming tide just after the Tarpon bite will put you in play for hungry Bonefish and possibly a shot at a Permit. Using small tan to olive crab patterns will work for both species. When just targeting Bonefish, spawning shrimp patterns seem just as good as small crab patterns. I have had some good luck working the edge of the flats in just a little deeper water for large Jacks as well. Pound for pound, they are one of the top fighters you can have on a fly. Lobster season is just opened, so keep a watchful eye out for divers. They hunt for lobster in the flats too. The Yellow tail fishing has been great just outside the reef line. Dolphin fishing has been sporadic this season. With most being found further out than normal. Nice size Tunas are also still being caught west toward the end of the Key West bar. It also has been a great year for Blue Marlin too. We’ve had many reports of 300-400 lb. releases all up and down the Keys. As always wishing you tight lines and fish boat-side!